Why subscribe to DENTAL ADVISOR? Since 1984, DENTAL ADVISOR has provided dental professionals worldwide with concise, accurate, and objective information using in-vivo and in-vitro results on the performance of products and equipment based on clinical and laboratory research. Enjoy limited online access for 12 months to THE DENTAL ADVISOR Online. 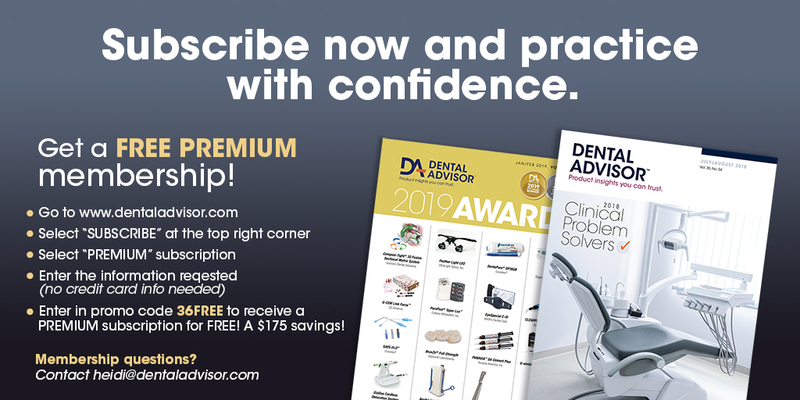 This subscription includes some of the special features of THE DENTAL ADVISOR Online such as the Manufacturer Directory, Product Updates & News, Complimentary Research Reports, and more. Plus, get access to 3 months of archived Clinical Evaluations and online issues. Have full online access to THE DENTAL ADVISOR. Access, save and print the archives and special features. All Clinical Evaluations and Ratings are available to you online, as well as premium features such as archived Editors' Choice awards, Ask the Editor questions, and the Product Comparison tables. One year of Premium access online, + 6 print issues mailed yearly, direct to your door. Claims for missing issues must be submitted in writing within six months of publication date. Issues claimed after this time will be billed at the single copy rate plus postage. Paper editions are only available for two years (quantities are limited).